Although Aerosaurus primarily offers champagne hot air balloon flights over the West Country, we diversified on Saturday however, tethering our new private/exclusive balloon at a open day at the University College of St Mark and St John. The event started at 10am and potential students, with their parents/friends, entered the university being greeted by ourselves. We then proceeded to keep the balloon inflated for a further 4 hours, whilst keeping it bound to the ground. The day was a great success, with exceptional weather for this time of the year! 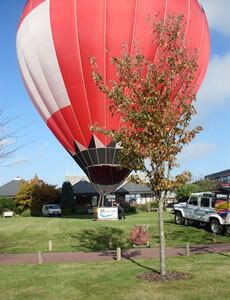 Aerosaurus has now also been asked to fly out from the University, this time instead, with our other new balloon. We plan to do this on either the 17th, 21st or 23rd of October, depending on the weather conditions.